Like them or loathe them, they cannot be ignored. 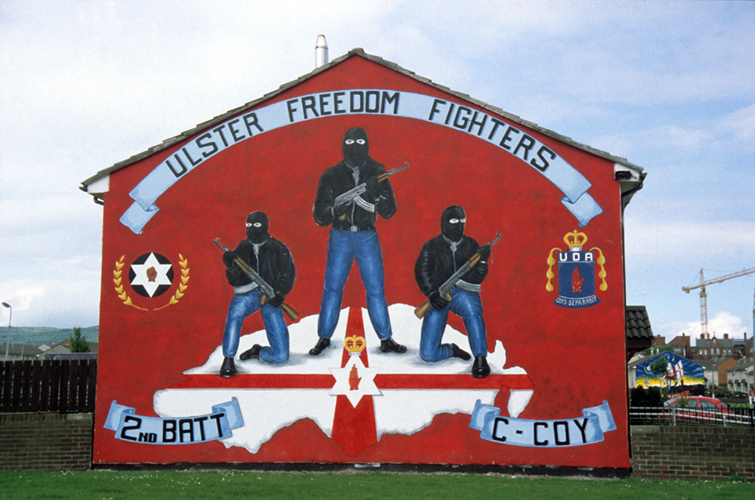 The political wall murals of the North of Ireland are an integral part of loyalist and republican communities. In its murals each group displays its hopes and fears, struggles and aspirations. Sometimes the murals are long-lived, more often their existence is fleeting. This unique collection of photographs captures a large selection of the murals in their original colour and grandeur. It provides a revealing glimpse into the ideologies of the communities which produce this lively political art. Bill Rolston, Drawing Support 2: Murals in War and Peace (Beyond the Pale, 1998). How can the political wall murals in the North of Ireland cope with the peace process and ceasefires? This second volume of unique photographs charts the changes in Loyalist and Republican mural painting between 1992 and 1995 and casts a tentative glance towards the future. I came across Rolston’s work after reading an article of his in Tinteán. My thanks to him for digging this one up for the blog.